SMU Distinguished Lecture - ANGELA M. HOUSAND, PH.D.
FutureCasting: Helping Students Become the Hero of Their Own Story! Using paper and pencil or a keyboard, list adjectives that describe you. For 3 minutes, you will write non-stop. Do not edit, just keep writing. After the timer goes off, we will debrief. You will have the opportunity to share some adjectives, but you will not be required to share. You will have 30 minutes to create a webpage that reflects WHO you are. Managing an online identity is crucial to your reputation, but first you have to know what kind of information exists about a person on the Internet. Find a partner to work with. Give your partner your full name. Search the name your partner just gave you. Try to find out as much information as you can about your partner. Share with your partner the information you found about them. Find pictures on the Internet that represent the strengths, weaknesses, opportunities, and threats in your life. Open the "swot_analysis_handout" document provided above. For each picture you find, locate the picture on the Cartesian coordinate system (see an example below!). 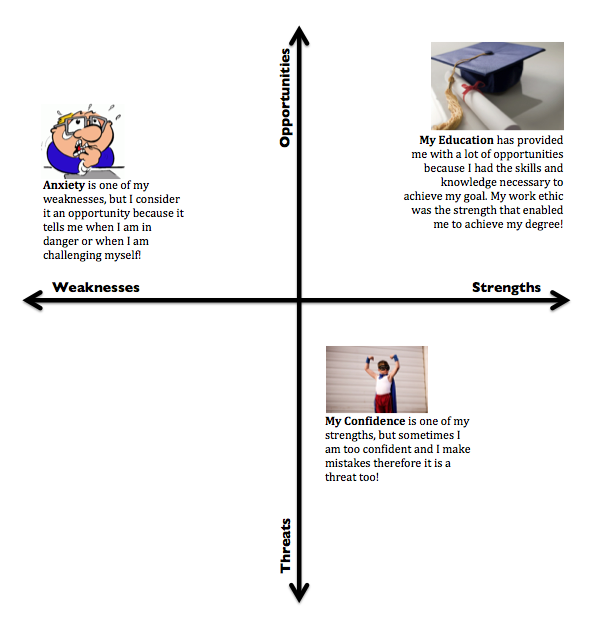 The x axis will range from weaknesses to strengths, and the y axis will range from threats to opportunities. As you place each picture on the Cartesian plane, make sure to consider where the picture best fits on the plane and provide a caption that explains why you placed the picture in that quadrant. Remember: You have to consider the relationship between the external factors and the internal factors when placing them on a Cartesian plane! Read the captions above each blue "x"
Find an image from the Internet for each caption (you will need 6 pictures total). Use your the images you found to replace each blue "x"
Save your document and submit your work as a .pdf file. Please take a moment to provide feedback about your experience today.